Jon Gruden has not lost confidence in quarterback Derek Carr following the Oakland Raiders' season-opening defeat to the Los Angeles Rams. Starting quarterback Carr struggled as the Raiders opened their NFL season with a 33-13 loss to the Rams on Monday. Carr completed 29 of his 40 passes for 303 yards in the game against Los Angeles, but he threw three costly interceptions and no touchdowns. 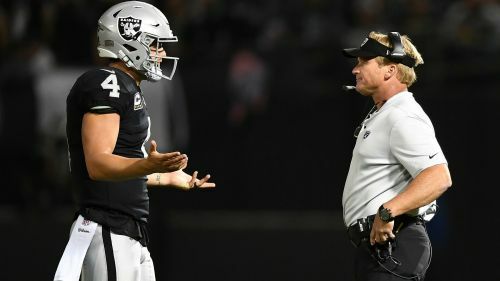 Raiders head coach Gruden, however, has no concerns over Carr ahead of their clash against the Denver Broncos on Sunday. "I don't have any doubts that Derek Carr is going to be great," Gruden said. "I can't wait to get started and get ready for the Broncos." Gruden added: "There was a few plays that uncharacteristically he wasn’t at his best. "Sometimes … you have to credit the defense. They gave us multiple looks. They have some talented people out there. Oakland re-signed wide receiver Martavis Bryant, 26, on Tuesday. The Raiders acquired Bryant in exchange for a third-round pick from the Pittsburgh Steelers in April but waived him earlier this month.